Will Texas A&M be sneaky good in 2016? Yes, but it might not show up in the win column. Let me explain. Texas A&M plays in the SEC West, the most difficult division in college football. With strength of schedule adjustments, the Aggies look better in my team performance ratings than their record over the past few seasons (8-5 in 2014, 2015). The Power Rank’s preseason model with its schedule adjustments ranks Texas A&M 10th for 2016. The Aggies are a strong program that would be the favorite on a neutral site against all but 9 teams. However, this rank doesn’t translate into a high expected win total. Texas A&M is the fourth of seven SEC West teams in the rankings. They travel to play the three teams below them (Arkansas in Arlington, Mississippi State and Auburn) and also play Tennessee out of division. This difficult schedule implies a predicted win total of 7.6 games. The Aggies struggled throwing the ball last season. However, the arrival of graduate transfer QB Trevor Knight, the Sugar Bowl MVP during his time at Oklahoma, should help the passing game immediately. On the other hand, Texas A&M has had an atrocious rush defense the past three season. They don’t match up well against strong rushing teams like Alabama and LSU. This article was adopted from The 2016 College Football Win Totals Report, which has my predictions for all 128 bowl subdivision teams. For more information on how to get your copy, click here. How talented is your college football team? If only recruiting mattered, which teams would contend for next season’s College Football Playoff? Here, I use a regression model to rank college football teams for 2016 based on the past four years of team recruiting rankings from Rivals. This model assigns a weight to each of the past four years to best predict on field performance in 2016. The model gets trained on data from past years. As a measure of a team’s performance in each year, I use its rating given by my college football team rankings at The Power Rank. This rating gets calculated by taking margin of victory in games and accurately adjusting for strength of schedule. Will these rankings accurately predict next season? This article looks at the top 25 teams by recruiting rankings for 2016. Will these rankings accurately predict team performance next year? However, I do have a better preseason model that has predicted the winner in over 70% of college football games before a single game has been played. This model drives my preseason rankings and win totals report. This report, which gives an expected win total for each college football team, is available to people who get my free email newsletter. This is also how I give a sample of my best football predictions during the season. Let’s count down the top 25 college football teams by recruiting rankings. The Bulldogs will no longer have the services of QB Dak Prescott, who set every school record for passing. This will make life difficult in the SEC West. The defense has plunged over the past two seasons (35th in 2014, 74th in 2015 by my yards per play adjusted for schedule). Can former Michigan coach Brady Hoke revive the Oregon defense as coordinator? Despite a small class of 20, James Franklin still recruited a top 25 class for Penn State in 2016. And perhaps the offense will improve as they transition from pro style QB Christian Hackenberg to an up tempo spread offense. After ranking 40th in these recruiting numbers last year, Baylor jumps into the top 25 this season with the 17th ranked class, by far their best of the past decade. Then coach Art Briles gets fired and replaced by the uninspiring Jim Grobe. Mark Richt, a good enough coach to not get fired at Georgia for 15 years, takes over the Hurricanes program. Always a strong recruiter at Georgia, he managed the 21st best class in his first year at Miami. Coach David Shaw continues to inspire a range of emotions in this Stanford alumni. First, the Cardinal embarrasses Iowa in the Rose Bowl. The 45-16 victory had every alum dancing to All Right Now. Then Shaw embarrasses the entire Stanford community with this reaction to satellite camps. It doesn’t make sense for us to go hold a camp some place where there might be one person in the entire state that’s eligible to get into Stanford. Hey coach, try not to make us all look like pompous asses. Will Muschamp? As a recent SEC power program, you couldn’t find someone with more head coaching success? Muschamp would have fared better at Florida had he found a player that could throw the ball with any accuracy. He needs to do better in the QB department to last at South Carolina. Mark Dantonio turned the Spartans recent success into the 18th ranked class in 2016, a strong result for a class of 20 players. Now they must deal with the loss of the best QB (Connor Cook) and tackle (Jack Conklin) in program history. The Sooners seemed to struggle in 2014 to an 8-5 record, but they went 1-3 in games decided by a touchdown or less. They rebounded in 2015 with an 11-2 record and a playoff berth last season, going 2-1 in close games. Can Charlie Strong find a quarterback? Returning starter Tyrone Swoopes will compete with Shane Buechele for the starting job this fall. Butch Jones couldn’t do better than the 5th ranked classes he had in both 2014 and 2015. However, he did get the 15th ranked class in 2016 with only 21 players. Tennessee will build on a program that played close games with Oklahoma and Alabama, both playoff teams last season. It seems like Jim Harbaugh’s team should rank higher than 14th after their top 5 class in 2016. However, the model takes a weighted average over four years that includes the 31st and 49th ranked class in 2013 and 2014 respectively. Michigan will rise in these rankings if Harbaugh continues to recruit top 5 classes. Is Kevin Sumlin an offensive guru? Or was Johnny Manziel just that good in college? In 2015, Texas A&M had the 63rd ranked pass offense by my yards per play adjusted for schedule. Then two quarterbacks transfer during the off season. Sumlin did bring in graduate transfer QB Trevor Knight. At Oklahoma, Knight won MVP of the 2014 Sugar Bowl when the Sooners beat Alabama. Jim Mora scored the 8th best recruiting class in 2016, tied for the best in program history over the past decade. They’ll need this talent to replace 8 players drafted into the NFL. The Gators had a strong 10-4 season in Jim McElwain’s first season, led by a top 10 defense. However, the offense was a ceiling for this team, with the rushing worse than the passing. How must Hugh Freeze felt on NFL draft day? Crap, they lifted the ban on satellite camps. Now I gotta go work in June. Well, at least Laremy Tunsil is getting drafted tonight. What??!! He posted a video with his smoking of a bong on Twitter? Well, at least my boy went 15th to the Dolphins. What??!! He told everyone that we play our players?? Freeze can’t wait to get back to camp and take a look at his 7th ranked class from 2016. The Rebels were one fluky fourth down bounce against Arkansas from winning the SEC West last season over Alabama. Can Kirby Smart take this program higher than Mark Richt? The long time Alabama DC has never been a head coach before. Smart passed his first test by recruiting the 9th best class of 2016, including three 5 star recruits. The championship game against Alabama must have traumatized Tigers fans. The defensive line whipped a solid Bama offensive line only to see a stellar secondary make repeated mistakes that cost Clemson the game. Still, a championship game appearance could only have helped Dabo Swinney recruit his second straight top 10 class. Expect Clemson to move up on this list next year. Will Muschamp had the defense headed in the right direction. After ranking 41st in 2014, Auburn’s defense jumped 19th in 2015 by my yards per play adjusted for schedule. Former LSU coordinator Kevin Steele takes over the defense for 2016. One of college football’s traditional powers, USC can attract just about any coach to take over their program. They decided on OC Clay Helton, who has never been a head coach. However, even Charlie Weis could recruit at USC. The Trojans had the 10th best class in 2016. Brian Kelly has done an exceptional job improving the talent at Notre Dame. The Fighting Irish had 6 players picked in the first round of the NFL draft. The offense was spectacular last season (2nd in yard per play adjusted for schedule), but the defense needs to catch up (48th). Les Miles hasn’t had a recruiting class worse than 8th the past four years, which leads to this lofty ranking. The tougher trick will be coaxing better QB play out of Brandon Harris. Jimbo Fisher has recruited a top 10 class each of his 7 years as head coach of the Seminoles. If he can get some solid QB play in 2016, Florida State will challenge for a playoff spot out of the ACC. In August of 2015, Ohio State was the toast of college football. Urban Meyer’s team had won the first playoff, and he was killing it as usual on the recruiting trail. Then in the most inexplicable game of 2015, Ohio State lost to Michigan State, a team without star QB Connor Cook. The loss cost the Buckeyes a spot in the playoff, and they lost 10 players to the first 3 rounds of the NFL draft. Now, heading into 2016, many believe that Michigan is a better team than Ohio State. I find this difficult to believe, and Ohio State’s recruiting rank of 2nd is only one reason why. Full disclosure: I live in Ann Arbor and consider myself part of the Michigan family (although I may get booted this preseason). For the past three years, I’ve talked Michigan sports on WTKA sports radio. Over seven of the past nine years, Nick Saban has recruited the top class in the nation. How talented is your college football team? If only recruiting hype mattered, which teams would contend for next season’s college football playoff? Here, we use recruiting rankings to rank college football teams for 2015. Sure, recruiting rankings don’t always accurately access the talent of teenagers. Five star recruits fail while a three star recruit like Johnny Manziel wins the Heisman in his freshman year. However, recruiting rankings look pretty good in the big picture. Matt Hinton showed that five star recruits have the highest chance to become an All-American, with diminishing chances for four and then three star recruits. I developed a regression model that uses four years of team recruiting rankings from Rivals to predict on field performance. This on field performance is defined by the team rankings at The Power Rank. The regression model simply assigns a weight to each of the past four years. We’ll count down the top 26 teams of 2015 below. But don’t go telling people “ED FENG THINKS USC IS BY FAR THE BEST TEAM IN THE PAC-12.” Not true. This model will never describe teams like Wisconsin, a program that never has a top 25 recruiting class but contends for a conference title every year. It will also overrate programs (cough, cough, Notre Dame) that never live up to their talent level. But hell, it’s fun to look at which teams have the most talent according to recruiting rankings. It will help pass the long 7 month off season. Wisconsin ranks 44th. Former coach Gary Andersen, who left for Oregon State this winter, lamented the tough academic standards that prevented him from recruiting some players to Wisconsin. TCU and Baylor rank 37th and 40th respectively. Guess coaching matters, as these should be top 10 teams next preseason. Missouri checks in at 32nd. Low recruiting rankings haven’t stopped Gary Pinkel’s team from winning the SEC East the past two seasons. Mark D’Antonio has produced a mighty fine team the last two seasons despite mediocre recruiting. With the probably return of QB Connor Cook, the Spartans should still be a very good team in 2015. Coach James Franklin came to State College with a reputation for recruiting, and he seems to be delivering. But can he fix QB Christian Hackenberg, the supposed NFL prospect whose completion percentage slipped from 59% to 56% from his freshman to sophomore year? Coach Todd Graham has elevated the level of recruiting in Tempe. Arizona State was outside the top 25 from 2009 through 2013 but has drawn the 20th best class the last two seasons. The Bulldogs had an amazing 10-3 year (well, they could have done better with a bowl win over Georgia Tech) and translated their success into the 16th best class this season. That’s their best rank since 2003. Frank Beamer is still getting good recruits to come to Blacksburg? Virginia Tech was a perennial top 25 team in The Power Rank but have fallen off since the 2011 season. Michigan has had two successive small recruiting classes, which has reduced their team rank the past two seasons. When recalculating these rankings using average stars per recruit, Michigan ranks 17th. The Hurricanes had a rough season. They ranked 17th in my ensemble rankings but finished with a losing 6-7 record. Al Golden recruited the 26th best class but 16th by average stars. Oregon always plays above their rank by recruiting numbers. However, 2015 will be a tough test for Mark Helfrich, as he loses QB Marcus Mariota and has many leaks to plug on the defense. Two years ago, Hugh Freeze made a big splash on recruiting day by signing multiple five star recruits on his way to the 7th best class. However, he hasn’t been able to replicate that success the last two years. It remains to be seen whether their successful 2014 season was a fluke or not. Steve Spurrier really had issues on defense this season, as South Carolina finished 37th in my team rankings in 2014. They didn’t finish outside the top 20 the previous four seasons. At least once during every Stanford game, I scream at coach David Shaw for some unthinkably bad decision. However, he wins games, and the 2014 Stanford team was much better than their 8-5 record suggests. In 2014, the Sooners won a huge bowl game over Alabama and entered the next season overrated. In 2015, they blew their bowl game against Clemson and will probably be underrated heading into next season. Bob Stoops continues to recruit at the same level, so expect them to challenge TCU and Baylor for the Big 12. The Bruins had a tremendous signing day, finishing with the 4th best class by average stars per recruit. Let’s see if this makes them into the top 10 team that people expect each preseason. Charlie Strong recruited the 12th best class to Texas. This is a fine haul anywhere except Texas, a program that had one class outside the top 5 from 2006 through 2012 under Mack Brown. It seemed like new coach Jim McElwain had a good National Signing Day when five star CeCe Jefferson committed. However, Jefferson still hasn’t sent his letter of intent, and Florida has the 23rd best class, their worst rank in any year since 2002. Butch Jones recruited his second straight 5th ranked class. Perhaps Tennessee can finally overcome the curse of Phil Fulmer, the Hall of Fame, national championship winning coach they fired in 2008. Mark Richt always recruits well. That’s why he can find a freshman (Nick Chubb) to replace the best running back in the country (Todd Gurley) when he gets hurt. Dabo Swinney recruited the best class of his tenure as Clemson head coach (4th by team, 7th by average stars). With a healthy DeShaun Watson at QB for the next two seasons, the future looks bright for the Tigers. The numbers back up Kevin Sumlin’s reputation as a top recruiter. Texas A&M had its third straight top 10 class in 2015, a feat they didn’t achieve the previous 7 years. Now, they need to fix that defense that has stunk for two straight seasons. The Fighting Irish recruit well no matter the coach. However, their play hasn’t lived up to their top 10 recruiting rankings, even under Brian Kelly. Since he arrived in 2010, they have finished 32nd, 21st, 11th (reached title game against Alabama), 23rd and 39th in my team rankings. It should scare the rest of the college football world that Auburn landed Will Muschamp as defensive coordinator. He was an excellent DC at Texas, and his reputation helped Auburn land top recruit Byron Cowart. Les Miles had only the 13th ranked class by average stars. This is only the second time since 2007 that his recruiting class by average stars finished outside the top 10. The Seminoles had the top ranked class in 2015 by average stars. Jimbo Fisher needs some of these guys to step in on a defense that struggled this season. Did these recruits see USC get gashed by Boston College this season? And they still decided to play for Steve Sarkisian and his 9-4 record this past season? USC had the top ranked recruiting class in 2015. For a team that won the first college football playoff, a 9th ranked recruiting class (10th by average stars) seems like a poor haul. However, Ohio State didn’t have one five star recruit on their offensive line that powered their running game this season. Duh? What did you expect? Nick Saban must be torturing himself because USC had a better ranked class (the first time since 2010 that Saban didn’t have the top ranked class by Rivals). However, Alabama still ends up at the top of these rankings that look at a four year window. I was watching the Arizona State and UCLA game last weekend when the Pac-12 standings popped onto the screen. It said that Utah had 1 conference win. One conference win? The Utes have only beaten Stanford? Despite their 4-7 record, Utah is a good team. In their non conference schedule, they beat BYU and Utah State, team ranked 22nd and 47th in The Power Rank. In conference, they have played almost all opponents tough, coming within a touchdown of beating UCLA despite throwing 6 interceptions. Overall, Utah ranks 27th in The Power Rank. If a team with one conference win ranks 27th, how good is the Pac-12 overall? 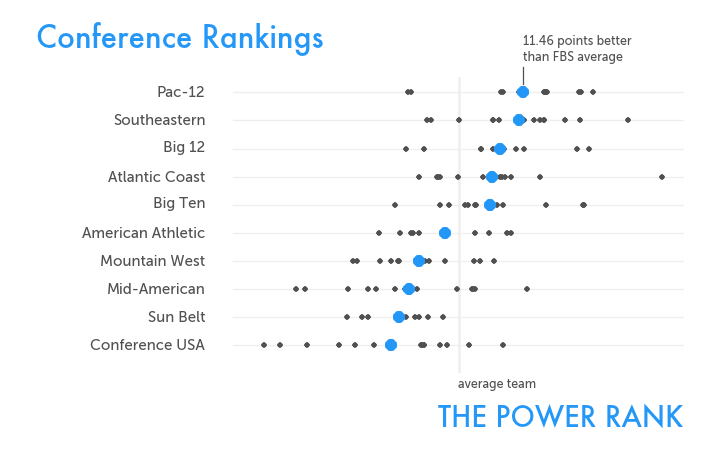 The visual shows the ranking of conferences by averaging over each team’s rating (The Power Rank’s estimate of that team’s expected margin of victory over an average FBS team). The Pac-12 slightly edges out the SEC as the top conference. While this does not conclusively show the Pac-12 is the better conference, it does suggest the two conferences are closer than anyone thinks. A few other insights from the visual. How bad is the bottom of Conference USA? UTEP (121st), Florida International (124th) and Southern Miss (125th) are the bottom of the FBS barrel. There is a clear distinction between the top 5 conferences and rest. The American Athletic Conference (formerly the Big East) does not make the cut… not by a mile. If not for the brilliance of Florida State, the Big Ten might move past the ACC as the 4th best conference. The Pac-12 has been remarkably tough this season. We’ll look at games with national title implications today, and none will involve a Pac-12 team. Last season, Auburn did not win a single SEC game. This meltdown landed them 76th in The Power Rank by year’s end and got coach Gene Chizik fired, two years after winning a national title. Former offensive coordinator Gus Malzahn took over as head coach and immediately elevated this team, as Auburn ranks 17th in The Power Rank. Some programs always have talent, which makes a quick turn around possible. As another example, Jim Mora has performed miracles at UCLA over the past two seasons. Auburn has only one loss all season, and a win over Alabama gives the Tigers the SEC West title and a place in the conference championship game. Can Auburn win? Auburn has an advantage because of their 11th ranked offense based on yards per play adjusted for strength of schedule. They run an up tempo spread attack that runs the ball on 69% of plays. However, they are also efficient through the air. QB Nick Marshall has led Auburn to the 14th best pass offense (yards per attempt adjusted for strength of schedule). Check out this match up visual for Auburn’s offense against Alabama’s defense. Better defenses appear further to the right to facilitate comparisons. Auburn has an edge in the passing game. Members of The Power Rank have access to interactive visuals like this for all college football teams. For more information, click here. Alabama is the favorite in this game, and this edge depends on their 15th ranked offense over Auburn’s 40th ranked defense. The Crimson Tide offense started slowly this season. 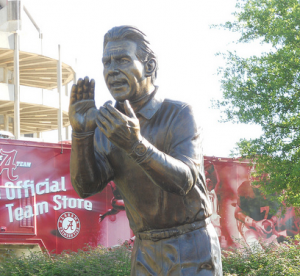 Coach Nick Saban would get steamed each week at their poor execution. This poor play prompted me to predict that Alabama wouldn’t win another championship on Grantland. But with each passing week, Alabama makes me look more stupid. They are clearly executing better and can throw downfield with QB AJ McCarron. The line favors Alabama by 9.5, but my yards per play numbers predict a 3 point win. Either way, the margin is close enough that a few turnovers or big plays on special teams could flip the result in favor of Auburn. What will be higher: the win probability for Michigan (25%) or the fraction of red in the Big House on Saturday? Michigan has struggled this season, losing 3 of their last 4 games. Meanwhile, an undefeated Ohio State creeps further into the national title game conversation each week despite their weak schedule. Ohio State has a prolific offense, ranked 5th by yards per play adjusted for strength of schedule. While their rushing attack behind Carlos Hyde gets most of the attention, they can also throw the ball well. QB Braxton Miller has completed 68% of his passes, leading the 29th best pass offense in the nation. They face a Michigan defense ranked 32nd. Ohio State does not have such an elite unit on defense. Their 22nd ranked defense is good, but has allowed teams like Iowa, Wisconsin and Northwestern to stay in games. They face a Michigan offense that has caused their fans more indigestion than Uncle Tony’s nachos last Thanksgiving. Florida State has jumped to elite this season. The Power Rank gives them a rating of 36 points, which implies they would beat the average FBS team by this margin. Over the last 30 years, this puts them behind only 1995 Nebraska (41 points) and just head of 2011 Alabama (35 points, beat LSU in title game). Florida State might not maintain this level with at least 3 more games on their schedule. But the Seminoles look potent on both sides of the ball. The offense and defense rank 4th in the nation by yards per play adjusted for strength of schedule. Florida could stay in this game. Just like Auburn and UCLA, the Gators always have talent, no matter how many wins they have this season. Despite a rash of injuries, their defense still ranks 10th in the nation, which could keep them in this game. However, they continue to struggle on offense, with the 95th ranked unit. Both the team rankings and yards per play predict a 25 point win for Florida State. Not many people are talking about Missouri in the national title picture. However, the one loss Tigers will win the SEC East if they beat Texas A&M. If Missouri then beats Alabama or Auburn in the SEC championship game, the BCS title game either includes Missouri (potentially over an unbeaten Ohio State team) or excludes the champion of the conference that has won the last 7 titles. The offenses will dominate the game between Missouri and Texas A&M. Missouri has senior QB James Franklin back from a separated shoulder. Their 10th ranked defense faces a Texas A&M defense that has struggled at 92nd in the nation. Texas A&M’s offense has been just as potent this season as last when QB Johnny Manziel won the Heisman. Both units ranked 2nd in the nation in yards per play adjusted for schedule. Manziel will look for redemption after a terrible game against LSU last week. The line started at Missouri by 3 but has since moved to 4. Both the team rankings (10) and yards per play (6) predict a bigger margin of victory for Missouri, suggesting some value in this game. South Carolina could lose this non conference game and still make the SEC title game. They win the SEC East if Missouri loses to Texas A&M. Then there is the potential for a 3 loss team to win the SEC championship game. This game should be close, as both the line and my team rankings predict only a 4 point win for South Carolina at home. Washington travels to Chicago to play a surprising Illinois team. Wisconsin travels to Arizona State. Thank you college football for these intoxicating early season match ups. Well, thank you, Big Ten and Pac-12. But at 3:30pm on Saturday, everyone will be watching Alabama at Texas A&M. Here are 5 factors to consider in predicting the outcome of the game. Texas A&M and QB Johnny Manziel have one of the most explosive offenses in the nation. Based on yards per play adjusted for strength of schedule, they rank 2nd behind Georgia. However, they face Alabama’s 2nd ranked defense (behind Florida). This is pure strength on strength, although one has to wonder whether 2 weeks of preparation for Alabama coach Nick Saban can tip the balance. If you saw any highlights from Alabama’s opening week win over Virginia Tech, you probably saw QB AJ McCarron getting sacked. 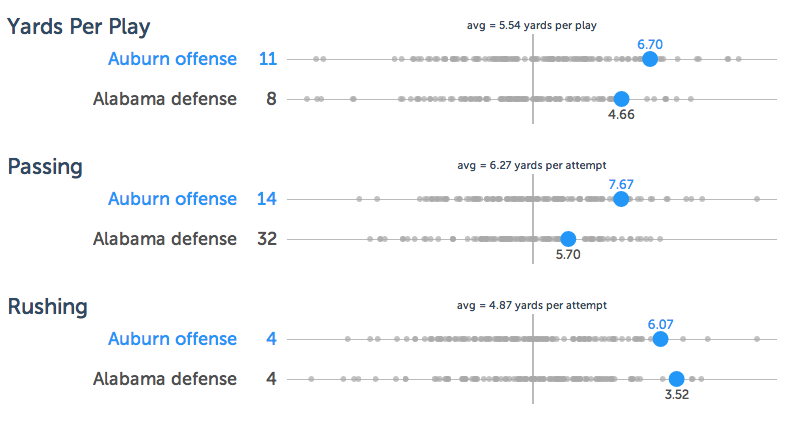 Their offense struggled, gaining 3.5 yards per play compared with a 5.73 FBS average. Alabama had to replace 3 offensive linemen chosen in the NFL draft (2 within the first 11 picks). If the team has any weakness, it’s along this front line. However, Alabama didn’t protect McCarron that well last season. They gave up sacks on 6.25% of pass attempts, 83rd in the nation. But Alabama did run the ball at will, opening up the play action pass for big gains. Texas A&M has played Rice and Sam Houston State, not quite the elite competition they will face in the SEC West. However, they gave up an astounding 6.21 yards per rush in those games. The FBS average is 5.08. Alabama only rushed for 3.5 yards per rush against Virginia Tech. With all the warnings about small sample size, this looks like weakness against weakness. The Alabama coach knows how to prepare a team. His teams have played well in the last 3 national title games in which they’ve had over a month to prepare. Since Alabama didn’t play last week, Saban has had two weeks to develop a defensive scheme to contain Johnny Manziel. I’m guessing this is a huge reason that Alabama is more than a 7 point favorite on the road. Vegas thinks Alabama, despite their troubles in week 1, are 10 points better than Texas A&M. However, scheme doesn’t always overcome talent. Saban could only watch as Cam Newton, another mobile quarterback, brought Auburn back from a 24-0 deficit to beat Alabama in 2010. I’m all about numbers on this site. They are an essential element of understanding football. But numbers will never tell the complete story about football. And numbers will never quantify what’s going on in Johnny Manziel’s head. He let a player from Rice, who probably spends most of his week on chemical engineering homework, goad him into a unsportsmanlike penalty. Johnny Manziel has a temper. And I bet that temper might show up if he gets frustrated against Alabama’s defense. Or if a defender takes a shot at his head or knee during the game. Manziel has lived a college football fantasy, with his Heisman trophy campaign last season. He probably hasn’t been frustrated on the football field since the LSU game last season, before he became a Heisman celebrity. CBS Sports will have a Johnny cam on the QB during the game. It should be excellent television. My numbers say Alabama is at most 7 points better than Texas A&M. With 3 points for home field advantage, I predict about a 4 point edge for Alabama in this game. The Prediction Tracker aggregates many different predictions for college football, and the average prediction is Alabama by 4.2 points. But there are intangibles to consider, like Nick Saban’s prep time and Johnny Manziel’s temper. These factors are most likely pushing the line to 7.5 points in favor of Alabama. I think it was even higher earlier this week. All factors point to better than even odds for Alabama to win on the road at Kyle Field.